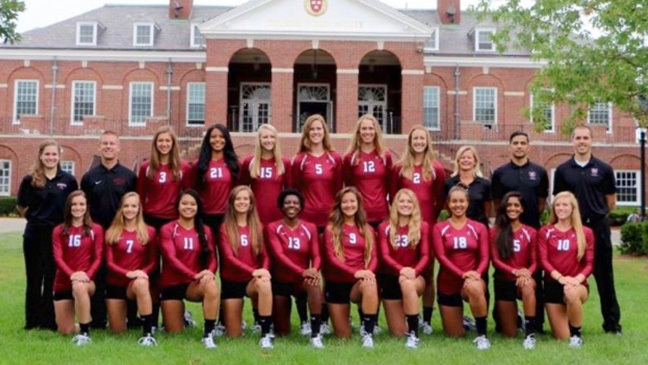 A new addition to the Harvard Crimson women’s volleyball team has been making waves and garnering attention from the University and the Ivy League conference. Freshmen middle blocker Christina Cornelius has been honored for her offensive and defensive prowess during her first month of collegiate gameplay. Cornelius, a Los Angeles native, wanted to attend a school with a positive reputation in academics and athletics. During her inaugural season, Cornelius had a series of career highs that complemented the team’s conference title run last season with 17 kills, 6 digs, and 41 attacks, according to Harvard Athletics. 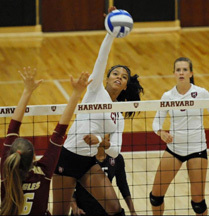 Cornelius’ hard work recently earned her Ivy League Rookie of the Week, according to Harvard Athletics. Getting the honor was a goal of Cornelius’. A role model and major influence for Cornelius is her grandfather Don Cornelius, the creator of the hit TV show Soul Train. Cornelius said there is a good sense of comradery among the team. The players give each other compliments along with constructive criticism. Cornelius plays with an air of equanimity, occasionally getting excited. After trying basketball and track at a young age, Cornelius said she began playing volleyball at 12 and played for the Mizuno Long Beach volleyball club. During her senior year at Windward high school, Cornelius was captain of the volleyball team and earned Dean’s list honors. She also earned a spot on the California Interscholastic Federation first team in both 2013 and 2014, according to Harvard Athletics. Transitioning to collegiate level gameplay is “a learning experience” according to Cornelius. Although the team suffered a loss by Darmouth on Sept. 25, they rallied back last weekend by defeating Princeton and Penn giving the Crimson a 2-1 conference record.